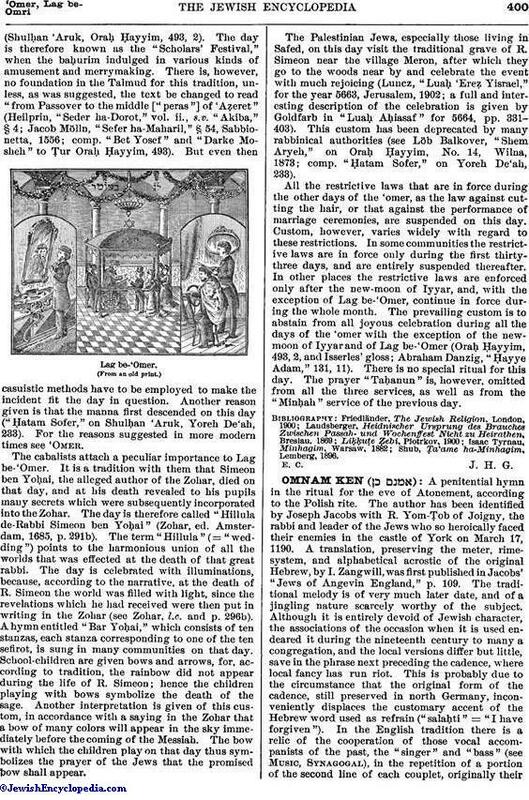 Thirty-third day in the period of the counting of the 'omer ("Lag" = , the numerical value of which is 33), corresponding to the 18th day of Iyyar. This day is celebrated as a semi-holiday, although the reason for this celebration has not been detinitely ascertained. The reason most commonly given is that the plague which raged among the disciples of R. Akiba during the period of the 'omer (Yeb. 62b) ceased on that day(Shulḥan 'Aruk, Oraḥ Ḥayyim, 493, 2). 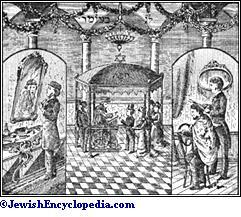 The day is therefore known as the "Scholars' Festival," when the baḥurim indulged in various kinds of amusement and merrymaking. 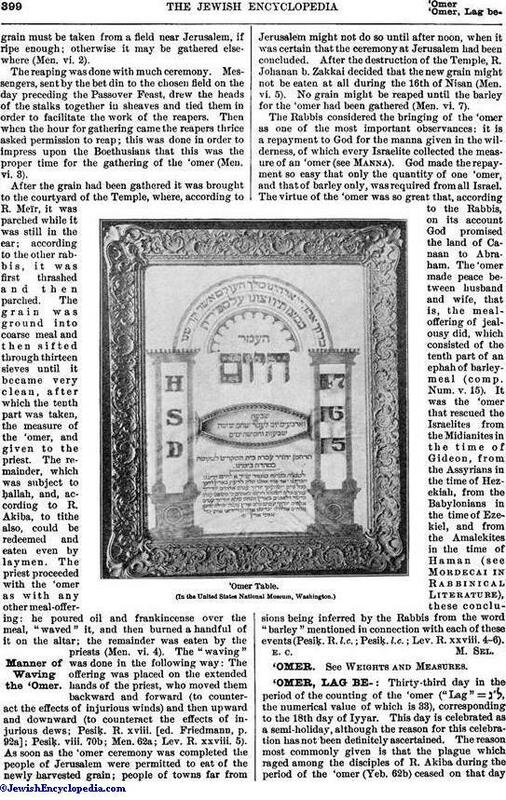 There is, however, no foundation in the Talmud for this tradition, unless, as was suggested, the text be changed to read "from Passover to the middle ["peras"] of 'Aẓeret" (Heilprin, "Seder ha-Dorot," vol. ii., s.v. "Akiba," § 4; Jacob Mölln, "Sefer ha-Maharil," § 54, Sabbionetta, 1556; comp. "Bet Yosef" and "Darke Mosheh" to Ṭur Oraḥ Ḥayyim, 493). But even then casuistic methods have to be employed to make the incident fit the day in question. Another reason given is that the manna first descended on this day ("Ḥatam Sofer," on Shulḥan 'Aruk, Yoreh De'ah, 233). For the reasons suggested in more modern times see 'Omer. The cabalists attach a peculiar importance to Lag be-'Omer. It is a tradition with them that Simeon ben Yoḥai, the alleged author of the Zohar, died on that day, and at his death revealed to his pupils many secrets which were subsequently incorporated into the Zohar. The day is therefore called "Hillula de-Rabbi Simeon ben Yoḥai" (Zohar, ed. Amsterdam, 1685, p. 291b). The term "Hillula" (= "wedding ") points to the harmonious union of all the worlds that was effected at the death of that great rabbi. The day is celebrated with illuminations, because, according to the narrative, at the death of R. Simeon the world was filled with light, since the revelations which he had received were then put in writing in the Zohar (see Zohar, l.c. and p. 296b). A hymn entitled "Bar Yoḥai," which consists of ten stanzas, each stanza corresponding to one of the ten sefirot, is sung in many communities on that day. School-children are given bows and arrows, for, according to tradition, the rainbow did not appear during the life of R. Simeon; hence the children playing with bows symbolize the death of the sage. Another interpretation is given of this custom, in accordance with a saying in the Zohar that a bow of many colors will appear in the sky immediately before the coming of the Messiah. The bow with which the children play on that day thus symbolizes the prayer of the Jews that the promised bow shall appear. The Palestinian Jews, especially those living in Safed, on this day visit the traditional grave of R. Simeon near the village Meron, after which they go to the woods near by and celebrate the event with much rejoicing (Luncz, "Luaḥ 'Ereẓ, Yisrael," for the year 5663, Jerusalem, 1902; a full and interesting description of the celebration is given by Goldfarb in "Luaḥ Aḥiasaf" for 5664, pp. 331-403). This custom has been deprecated by many rabbinical authorities (see Löb Balkover, "Shem Aryeh," on Oraḥ Ḥayyim, No. 14, Wilna, 1873; comp. "Ḥatam Sofer," on Yoreh De'ah, 233). All the restrictive laws that are in force during the other days of the 'omer, as the law against cutting the hair, or that against the performance of marriage ceremonies, are suspended on this day. Custom, however, varies widely with regard to these restrictions. In some communities the restrictive laws are in force only during the first thirty-three days, and are entirely suspended thereafter. In other places the restrictive laws are enforced only after the new-moon of Iyyar, and, with the exception of Lag be-'Omer, continue in force during the whole month. The prevailing custom is to abstain from all joyous celebration during all the days of the 'omer with the exception of the new-moon of Iyyar and of Lag be-'Omer (Oraḥ Ḥayyim, 493, 2, and Isserles' gloss; Abraham Danzig, "Ḥayye Adam," 131, 11). There is no special ritual for this day. The prayer "Taḥanun" is, however, omitted from all the three services, as well as from the "Minḥah" service of the previous day. Shub, Ṭa'ame ha-Minhagim, Lemberg, 1896.